Russian musician Yulianna Avdeeva has become the first woman in 45 years to win the prestigious Chopin Piano Competition in Warsaw, Poland. Ms Avdeeva, 25, who won £26,506, said she had been working towards winning the competition her "whole life". 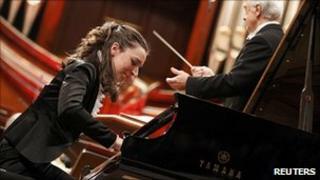 Held every five years, the contest for young pianists is one of the most important in the classical music world. Martha Argerich, a past winner and member of the jury, caller Ms Avdeeva a "harmonious artist". She added: "I am extremely happy about Yulianna, and particularly because she is the first woman after 45 years. After me there was no lady, so I am very happy." Previous winners, including Maurizio Pollini and Martha Argerich, have gone on to become the greatest pianists in modern times. The contestants spent three weeks playing works by Frederic Chopin during a series of concerts. "Chopin's music is so very special, I was enjoying every performance because I was not thinking about the competition, but was thinking about the music only," Ms Avdeeva said. The runner-up prize was shared between Ingolf Wunder, a 25-year-old Austrian, and Moscow-born Lithuanian Lukas Geniusas, 20. The competition started in 1927 and has been held every five years since, except for a hiatus during World War II.